Samaritan Place is operated by Emmanuel Care. Learn more about the Ministry, its mission and facilities. TOURS of our home - 10:30 am, every Tuesday. See this month's Life Enhancement calendar AND Newsletter . 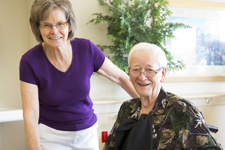 We are a Catholic health care facility where care is compassionate, resident directed, safe and respectful. We advance the healing and caring ministry of Jesus Christ by responding to needs of the spirit, mind, body and culture of those who enter our home. A home where everyone who enters can experience harmony in relationships and joys in everyday life. Human dignity: Focusing on each person as a unique individual to be respected and cherished. Compassion: A quality of presence and caring that accepts each person as they are, to foster healing and wholeness. Holistic Care: Focus on healing the whole person through the unity of body, mind, spirit and culture that is sensitive, open, and respectful to each person. Collaboration: Residents, families and staff work together to create a fulfilling and meaningful life for all. Integrity: Trust and mutual accountability are rooted in dialogue between all who live and work in this home. Our philosophy of self-led teams and our grounding in resident-directed care are part of what truly make Samaritan Place different.